WOW Golden Thread Escape is another point & click escape game developed by WOWEscape. 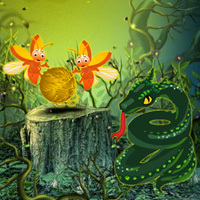 In this game, you need to find the golden silk thread in this fantasy forest. By finding useful objects, hints and solving puzzles, find the silk moth and get the golden silk thread from it. Good luck and have fun! Quick and easy. Don't miss flower in pond, 3rd level, far left scene. My game froze also and reload game button does not work UUGG! Really enjoying this one until I accidentally closed window, NO RELOAD function available? - hate when they show a Reload button on main screen and it never works. Red X. Game froze after viewing clue from jars in second scene. Boo. Took me the longest time to fine lily in pond in the last set of scenes. Great game!